Have you ever wanted to create a sweater with beautiful cables, but you didn't know how to knit? 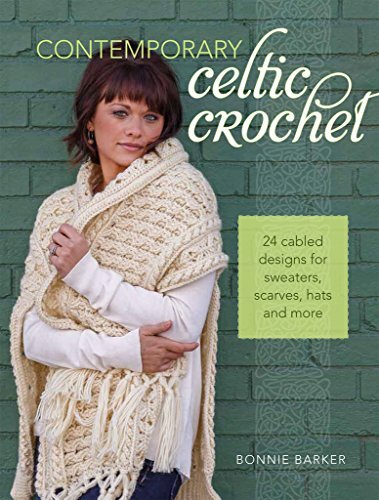 Now, in Contemporary Celtic Crochet, you can learn how to use basic crochet stitches to create the same stunning effect on sweater wraps, stoles, cardigans, and more. This book features easy projects, such as hats, scarves and device covers, and more difficult projects, including sweaters, wraps and blankets. Make the Hialeah Honey Baby Blankey to swaddle a newborn or create the Inisheer Sweater Wrap to stay cozy in cool weather. The Cables Meet Lace Cape is perfect for evenings out, and the Pennywhistler's Pack will let you carry your essentials on any day trip. These Celtic-inspired stitches and projects are the perfect addition to your crochet repertoire.